Blurriness - The amount the image is blurred, in pixels. There's a maximum value of 256. Blur Dimensions - Controls bluring only vertically, horizontally, or in both dimensions. 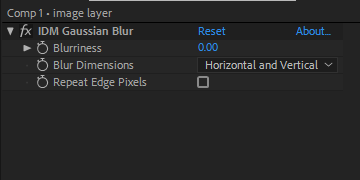 Repeat Edge Pixels - Select this option to make the blur algorithm operate as if the pixel values beyond the edge of the layer are the same as the values of the edge pixels. This option keeps edges sharp, preventing them from darkening and becoming more transparent.